WAHOO!!! The Slaughters had the BEST Spring Break! I can't wait to share all the goodness with you. First of all, that blog break was nice but it's so good to be back! Last week was Spring Break around these parts and we took every advantage by Setting Sail on a Disney Cruise with the Shull Family. Shay and I booked this trip last summer so to say we were all ready would be the biggest understatement. The pilot noticed our family getting on and was so sweet talking to the kids about the flight. Then on the speakers when the pilot was talking he mentioned our family and told us again to have a great vacation on board. So nice of him to do that! Nix and I had big plans of watching The Good Dinosaur. That movie didn't disappoint! We snagged our rental van, hit up the hotel, and were back on the road bright and early to SET SAIL! Can you tell who they're waiting for here?? We met the Shulls at the airport and then boarded the Disney shuttle. We checked in and waited patiently to board the ship. This was our cabin for the next four nights. It took Nixon all of three seconds to hop on the couch and show me his muscles for this picture. WHAT?! I was CRAZY impressed with our room. Tab and I slept on the queen bed, the couch became a twin bed, and two bunks pulled down off the wall. The three kiddos all slept there and it was plenty of room. The veranda was so nice as well! Let me just say how AMAZING the littles were on this trip!! 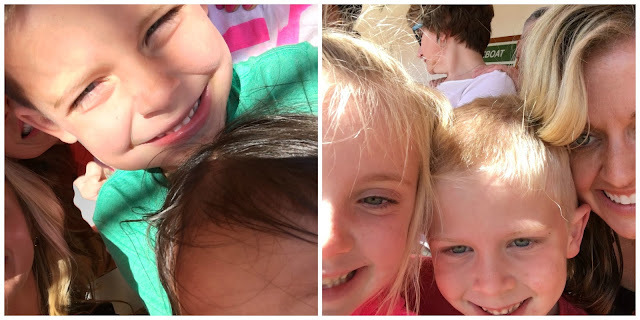 Some days they got naps and some days they didn't, but they hung in there like big kids! They were fabulous! After our drill, we all headed back to our rooms to get ready for dinner! Notice those bands on the kiddos wrists...they're a GPS band. In case a child gets lost, Disney can find them ASAP. Also...when they were inside the kid's area (it was HUGE) they would tell us which area each kid was playing in based on these bands so we'd know where to pick them up. Usually on a cruise, you have dinner in the formal dining room every night with the same wait staff. On a Disney cruise, you rotate dining rooms (which was WAY fun) and your wait staff rotates with you, which is even better. By night three, they were already bringing our kids extra food because they knew what they liked. They were the best! Bowen got preoccupied mid-pic. ha! Our dining room on night one was called Animator's Palate. The entire room was black and white including all the staff's clothing ensembles. Throughout the meal, pictures were being "drawn" on some walls and at the end of the meal the staff put on a big show. The entire room changed to full blown color! It was super cool and the kids loved it! Headed to our first show on ship! This picture makes me laugh. Did someone throw popcorn on Ashby? What is that? This was our area every night for the show. Night one we watched Twice Upon a Dream, a cute little story about Cinderella. We woke up the next morning in the BAHAMAS!! I can't wait to hear about the rest of your trip! I'm having Disney withdrawal, ha! So glad you have a family of friends that you can vacation with! The Disney cruise looks really nice, and I love that the dining room changed during your dinner! Can't wait to read about the rest! Have a great Monday! Looks like y'all had a blast! The wristbands that track your kiddos is so cool!! Glad y'all had fun. I want to go baaaaaaaack! Like right this minute!!! I loved all of your pictures!!! And I couldn't agree more, our sweet littles did an amazing job!! They were such troopers! I can't wait to keep reading!!! Looks like you guys had a blast!!! Hahaha!!! So is Ebby Lee! :). You guys would love a Disney Cruise! Conpletely agree-we have some awesome friends!! This dining room was so much fun! The kid favorite for sure! Yes, we never lost a kid (well for more than just a second) so we didn't have to use them but there was peace knowing they were there. You Disney fanatics should do a cruise next!!! You guys would love it!! Thank you!! That restaurant was so cool! It kept the kiddos entertained for sure! 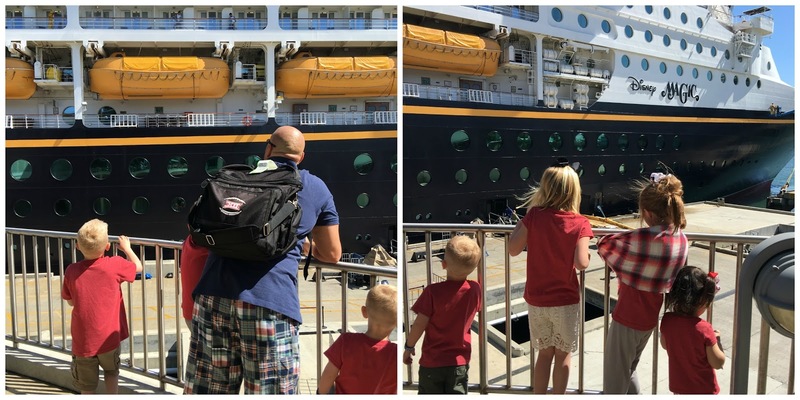 We have gone on two Disney cruises with our friends and their kids! It really is the best vacation ever!! Oh I want to go on a Disney cruise so bad! It looks like you guys had so much fun! It looks like you had so much fun!! Where did you find your floral dress? Nancy needs to go one day! You guys would love it! We did, Kara!! Your crew would love it! Thank you!! I found it at Altar'd State. I bet it's online. I just purchased it recently. We did a Disney Cruise three years ago. You are making me want to book one asap! We loved every minute of it!!!! So glad you had fun on your Disney Cruise. We are going on our fifth Disney Cruise in September. They are amazing and addicitng! So fun!! 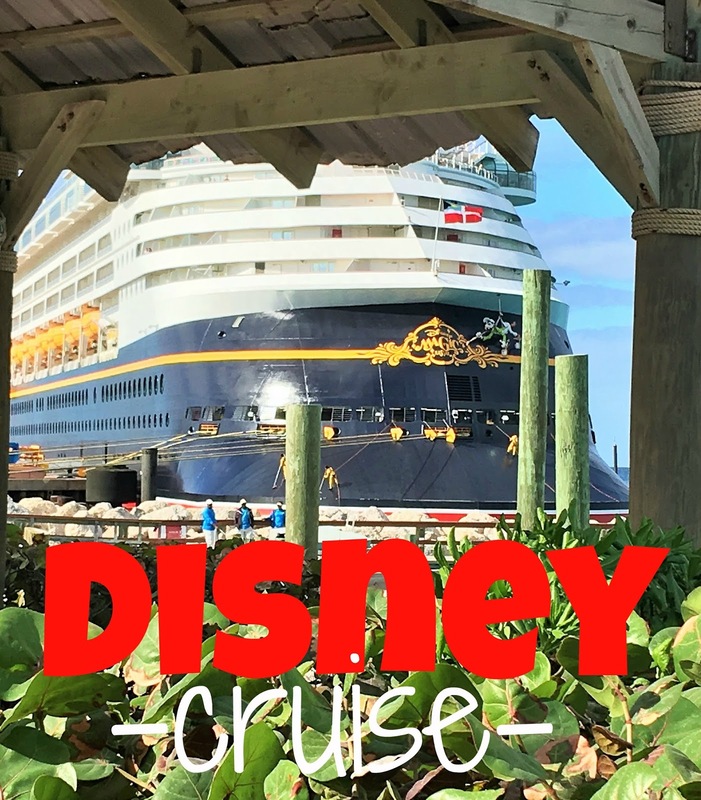 This post makes me want to jump on to a Disney Cruise TODAY! 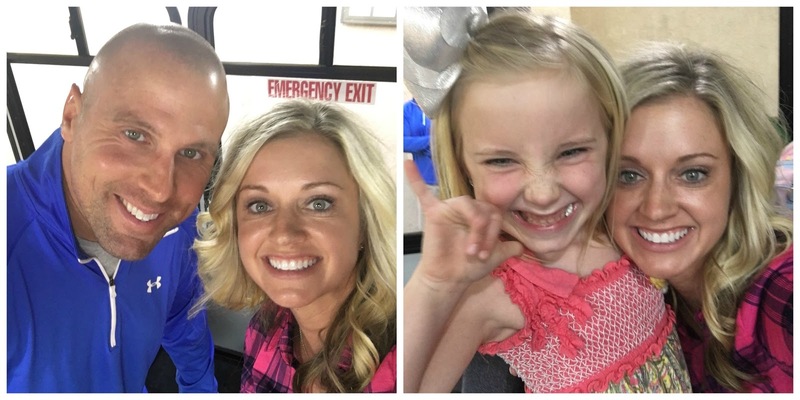 Loved seeing all these fun pictures! Great pics! Looks like so much fun. Could you please share where your pink plaid shirt is from that you wore on the flight? Thanks. Oh man - I can't wait to read this week!! What fun - I know your kiddos had a BLAST!! Love this recap and I LOVE that they put a GPS band on each kid! That is brilliant! Is the GPS part new? We were on The Dream this past July and didn't think they were GPS enabled. Would a Disney cruise be good for a couple without children or are kids the focus? We did too, girl! Can't wait to go back! Hahahaha!!! I can totally see that! It was fun and super entertaining! It's from a local boutique. :( So sorry! It washed well too! They sure did!! Thank you! Maybe they are new or were just testing them on our ship? It was $95 to replace a lost one (and unfortunately that happened to one of our kids). Oh wow! That must be new. They also "locked" the kid bands when they put it on. My daughter couldn't take it off until the cruise was over. They had two different color locks depending on allergies. Red and black I think. Banda were blue. We returned the band at the end. If not, to keep it was around $25. I love reading about your trip! Thanks for sharing, I can't wait to take my family someday!!! I loved your kids matching swim suits... Where are they from? Thanks! Erika, where did you get those cute lace shorts you wore to Pirate night? The GPS bands...super cool. Disney truly thinks of everything! Did the cruise leave out of Port Canaveral? We headed to Cocoa Beach last Saturday on our vacation and I saw all the Disney cruises and thought about you guys. Those ships are huge...we had a really long discussion about how much it would take to turn that sucker over for the next cruise. Looks like an amazing trip!